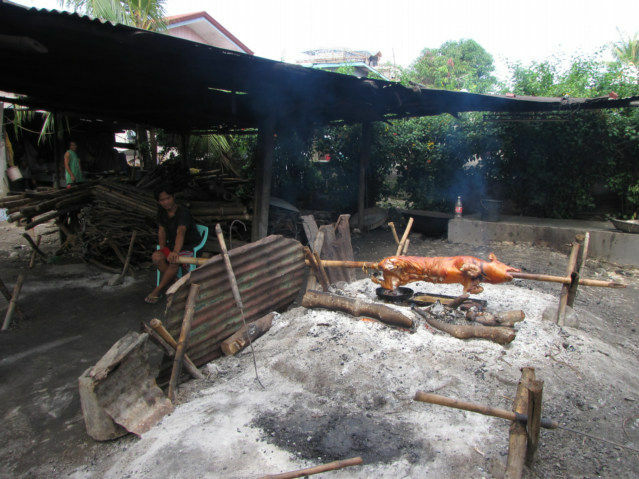 Across the street from the central market and one street back is what appears to a place where they are always roasting a pig on a spit in Bauang, Philippines La Union Province. The color of the pig to me in great, it looks delicious. This is not the delicious part, looking at the pig looking at me. I need to walk back there and see if this is a business that roasts a pig all the time, or if it was a special occasion. It hit me as I was walking away that this location looked permanent. Lechón is a pork dish in several regions of the world, most specifically Spain and its former colonial possessions throughout the world. The word lechón originated from the Spanish term leche (milk); thus lechón refers to a suckling pig that is roasted. 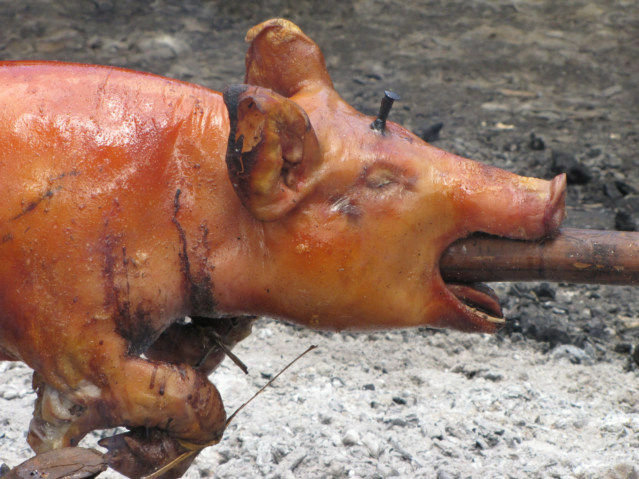 Lechón is a popular cuisine in the Philippines, Cuba, Puerto Rico, the Dominican Republic, other Spanish-speaking nations in Latin America, and Spain. The dish features a whole roasted pig cooked over charcoal. Nowadays in most of Latin America, the original use of a suckling pig has given way to a medium-sized adult pig. In most regions, lechón is prepared throughout the year for any special occasion, during festivals, and the holidays. 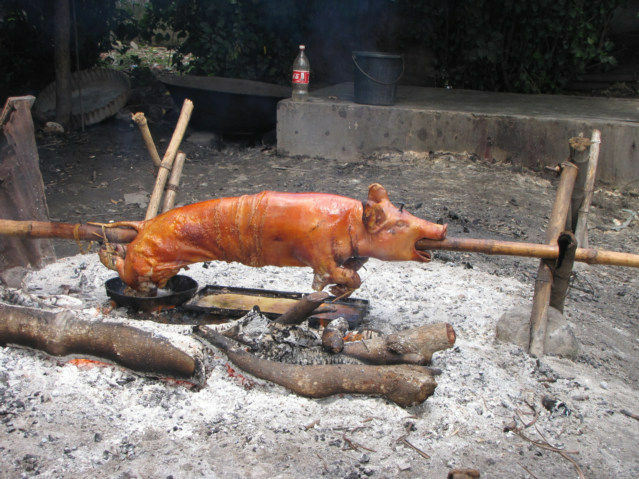 After seasoning, the pig is cooked by skewering the entire animal, entrails removed, on a large stick and cooking it in a pit filled with charcoal. The meat is placed over the charcoal, turning the stick in a rotisserie action. The meat is roasted on all sides for several hours until done. The process of cooking and basting usually lends itself to a crisp skin, which is also served with the meat. In the Philippines, lechón is served with plum or other sauces, vinegar, or with other seasonings or accompaniments. In the Philippines, the term lechón also came to mean any meat prepared by cooking on a pit, such as lechón baka (roast beef) and lechón manok (roast chicken). There are other Philippine versions of lechón, known as lechón kawali and Paksiw na lechón. Lechón kawali involves boiling the processed meat, and then frying the pieces of pork in a frying pan. Paksiw na lechón involves cooking the left-overs of the main-course lechón by boiling it in a vinegar mix, making the meat moist, and then stir-frying it along with other marinated ingredients. Rotisserie is a style of roasting where meat is skewered on a spit - a long solid rod used to hold food while it is being cooked over a fire in a fireplace or over a campfire, or roasted in an oven. This method is generally used for cooking large joints of meat or entire animals, such as pigs, turkeys, goats or historically, entire cattle. The rotation cooks the meat evenly in its own juices and allows easy access for continuous basting if desired. In medieval and early modern kitchens, the spit was the preferred way of cooking meat in a large household. A servant, preferably a boy, sat near the spit turning the metal rod slowly and cooking the food; he was known as the "spit boy" or "spit jack". More mechanical means were later invented, first moved by dog-powered treadmill, and then by steam power and mechanical clockwork mechanisms. Spits are now usually driven by electric motors. Rotisserie can also refer to a mechanical device used for rotisserie cooking, or to a restaurant specializing in spit-roasted meat and chicken. The word comes from French where it first appeared in Paris shops around 1450. Additionally, in restaurants a rotisseur is the chef responsible for all spit-roasted, oven roasted, grilled and in some cases fried foods. Anthony Bourdain, I am finally understanding American food culture. Anthony Michael "Tony" Bourdain (born June 25, 1956) is an American author and chef. He is well known for his 2000 book, Kitchen Confidential: Adventures in the Culinary Underbelly, and is the host of Travel Channel's culinary and cultural adventure program Anthony Bourdain: No Reservations. A 1978 graduate of the Culinary Institute of America and a 28-year veteran of professional kitchens, Bourdain is currently a "Chef-at-Large" whose home base is Brasserie Les Halles, where he was executive chef for many years. Bourdain was born in New York City but grew up in Leonia, New Jersey. Bourdain has French ancestry on his father's side his paternal grandfather immigrated to New York from France following World War I. Bourdain attended Vassar College, and graduated from the Culinary Institute of America in 1978. Currently, Bourdain is honorary Chef-at-Large of Brasserie Les Halles, where he held the title of executive chef for nearly a decade. When he is not traveling, Bourdain lives in Manhattan. Bourdain married his high-school girlfriend, Nancy Putkoski, in the 1980s, and they remained together for two decades before divorcing Bourdain has cited the irrevocable changes that come from traveling widely as the cause of the split. He currently lives with his second wife, Ottavia Busia. Together, they have one daughter, Ariane, born on April 9, 2007 the couple wed on April 20, 2007. In Kitchen Confidential, Bourdain describes how his love of food was kindled in France — when he tried his first oyster on an oyster fisherman's boat as a youth while on a family vacation. Later, while attending Vassar College, he worked in the seafood restaurants of Provincetown, Massachusetts, which sparked his decision to pursue cooking as a career. Bourdain graduated from the Culinary Institute of America in 1978, and went on to run various restaurant kitchens in New York City — including the Supper Club, One Fifth Avenue, and Sullivan's — culminating in the position of executive chef at Brasserie Les Halles beginning in 1998. Brasserie Les Halles is based in Manhattan, with additional locations in Miami and, at the time of Bourdain's tenure, Washington, D.C. and Tokyo, Japan. Bourdain gained immediate popularity from his 2000 New York Times bestselling book Kitchen Confidential: Adventures in the Culinary Underbelly. The book is a witty and rambunctious exposé of the hidden and darker side of the culinary world, and is a memoir of Bourdain's professional life as well. Bourdain subsequently wrote two more New York Times bestselling nonfiction books: A Cook's Tour (2001), an exotic account of his food and travel exploits across the world, written in conjunction with his first television series and The Nasty Bits (2006), another collection of exotic, provocative, and humorous anecdotes and essays mainly centered around food. Bourdain's additional books include Anthony Bourdain's Les Halles Cookbook the culinary mysteries Bone in the Throat and Gone Bamboo a hypothetical historical investigation, Typhoid Mary: An Urban Historical and No Reservations: Around the World on an Empty Stomach. Bourdain's articles and essays have appeared many places, including in The New Yorker, The New York Times, The Times, The Los Angeles Times, The Observer, Gourmet, Maxim, Esquire (UK), Scotland on Sunday, The Face, Food Arts, Limb by Limb, BlackBook, The Independent, Best Life, the Financial Times, and Town and Country. On the Internet, Bourdain's blog for Season 3 of Top Chef was nominated for a Webby Award for best Blog – Cultural/Personal in 2008.